Situated between the sea and mountains in Languedoc Roussillon, Saint Cyprien has many attractions and a marina, ranked 3rd in France. 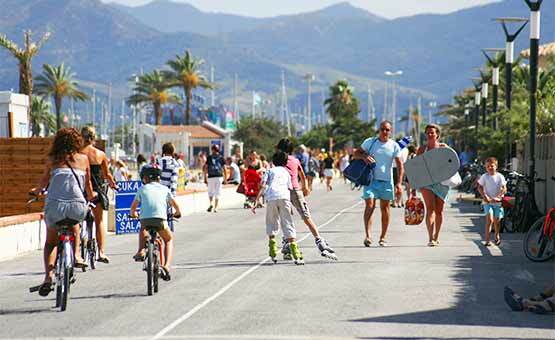 It is THE Pyrénées Orientales resort for a relaxing holiday at the Saint Cyprien campsite. Discover Saint Cyprien: a preserved natural environment, six kilometres of fine sandy beach, Catalan gastronomy and an intense cultural life. A few kilometres from Argeles sur Mer and Collioure, the jewel of the ruby red coast, and 40 kilometres from the Spanish border, Saint Cyprien is a great base for discovering the different aspects of the region. The southernmost in France, and not far from Barcelona, it is only 90 minutes from the Pyrénées Catalanes ski resorts. Lovers of culture will be delighted by the modern art museum, nearby vineyards, the historical heritage as well as the natural sites…the choice is yours. It’s not a myth – it’s the Pyrénées Orientales! Spoil yourself for a few days with a glass of Rivesaltes and be spellbound by the Catalan lifestyle. The Catalan coastline – a natural destination! Discover the fabulous seaside and forest landscapes of our coastline reserves: Massane, Mas Larrieu, Etang de Canet-St-Nazaire and Réserve Marine de Cerbère-Banyuls with the amazing “underwater path”. Forget your worries, leave stress behind… That’s what the Pyrénées-Orientales diving clubs and centres propose with introductory, exploratory or technical dives. Situated at the entrance to Peyrefite beach in the heart of a sheltered bay, go on an underwater visit with a mask, flippers and a snorkel. Take the marked path and explore the subaquatic depths of the Pyrénées-Orientales natural marine reserve! The great outdoors in Pyrénées Orientales! Discover an exceptional natural setting, from the Mediterranean to the Pyrénées, on a Languedoc Roussillon campingholiday! You will just love exploring, either HIKING, CYCLING or HORSE RIDING. It is rare to meet all the stages of human genius in one area: tools created by Tautavel Man 450,000 years ago, vestiges of the glory of the Antiquity, the power of the Majorca kingdom illustrated by the presence of Gothic art. Over 500 monuments to explore! Religious, civil and military monuments, galleries and gardens. Plane and palm trees line the wide sun-drenched avenues. In their shade, Maillol’s proud naked beauties dance in the corner of a courtyard or a small square beside a singing marble fountain. The haughty splendour of the Kings of Majorca look down over the narrow streets filled with the local public and overflowing with spices, fruits and fish and an abundance of exotic scents and flavours… Perpignan, the capital of Pyrénées Orientales, is also the uncontested capital of Catalonia! Explore the campsite surroundings in Languedoc Roussillon: Saint Cyprien, Argeles sur Mer, Collioure. venenatis Phasellus amet, Aliquam fringilla Curabitur nunc consequat.